Companies that don't charge you fees or commissions to invest directly through its Direct Investment Plan--or DRIP. DRIP Club Members get complete prospectus details for every DRIP as well as advanced screening capability, which allows them to identify companies based on fees, industry, dividend yield, and more. To sign up for the DRIP Club Membership, please click here. All Available DRIPs in One Handy Guide! 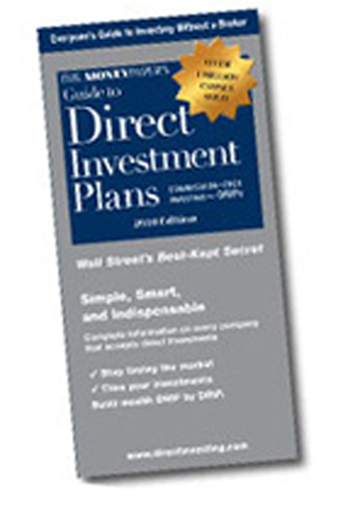 The Moneypaper's Guide to Direct Investment Plans is the most comprehensive, reliable DRIP information resource available. It gives you the complete details of more than 1,300 plans--or virtually every company plan offered. With this information, you can select stocks like Johnson & Johnson, Paychex, Pitney Bowes and many other high-profile stocks that offer DRIPs that don't charge fees. Start benefiting from one of the most innovative and inexpensive ways to accumulate wealth over the long term--direct investment plans (DRIPs). By investing through DRIPs, you can easily and efficiently take advantage of two important risk-reducing strategies that were formerly accessible only to affluent investors: wide diversification among companies (and Industries) and dollar-cost-averaging. The Moneypaper's Guide to Direct Investment Plans works for you by explaning how the process works and identifying all of your choices.